Everything you need to know about creating effective marketing case studies that will help you convert more leads. Showcase success using compelling case studies. Put yourself in your customer’s shoes and imagine you were considering purchasing a new product. A) Chat with a salesperson — while trying to block out the tiny voice in your head reminding you that they’re working on commission? B) Review a case study about a customer who used that product to solve a problem similar to yours? Probably option B, right? That’s because we put more trust in word-of-mouth marketing than we do salespeople. The way people consume information has changed, and buyers have all the resources they need to make decisions about what to purchase. Companies can either continue marketing the old, less effective way … or they can embrace these changes and let their customers do the work for them through testimonials, reviews, word-of-mouth marketing, and marketing case studies. Customers trust other customers — the companies that recognize this will benefit in the long run and grow better. Plenty of companies have already proven how beneficial marketing case studies can be. They are the most popular form of self-promotional marketing used by marketing agency executives in the U.S. Additionally, 88% of surveyed B2B marketers say that customer case studies are considered to be their most impactful content marketing tactic. While chatting with a salesperson can be helpful, and even preferable for some, it’s clear that having marketing case studies on your website can be beneficial. Case studies answer potential customers’ questions, demonstrate success, build company-wide credibility, increase conversions, and most importantly, eliminate bias so your customer can make a confident decision to buy your product. Marketing case studies analyze the ways that a customer uses a product or service. They describe a challenge the customer faced, the solutions they considered, and the results they experienced after their purchase. Strong case studies can compel others to buy a product. The use of marketing case studies is beneficial to companies of all sizes and customers of all backgrounds. Well-crafted marketing case studies provide potential customers with engaging content that excites them to buy your product. Case studies often involve an interview with a customer that has had success using your product. Before choosing a customer for an interview, consider who you’re targeting. Your case studies should appeal to your buyer persona. When your target customer feels connected to your case studies, they will feel more confident in their purchase. Consider this: You’re buying a new software for your team. You have a few possible options in mind, so you head to their respective websites to do your own research. The first two options sound good on paper (or rather, on screen), but you want a solution you can really trust. Something that is preferably not written by the company itself. The third site you go to has a landing page that includes a few case studies. One of the case studies features an interview with an employee at a company similar to yours. You listen to that person describe challenges that they faced prior to getting the software — challenges that sound a lot like the ones you and your team currently face. The interviewee then talks about the ways that their software purchase resolved their pain points. Wouldn’t the case study you found on the third website make you feel confident that the software could help your team, too? The key to creating relatable case studies is considering your buyer personas. That means considering demographics, company size, industry, etc. and selecting a person that the majority of your potential customers will feel a connection. Take a look at HubSpot’s case study landing page. Check out the wide range of case studies listed. Notice how these case studies cover all types of industries, a wide variety of locations, different company sizes, and more. If there are so many companies using HubSpot — to solve a vast array of challenges — then wouldn’t you assume HubSpot has a solid product that you could trust, too? Case studies demonstrate success by showing potential customers that current customers — who once had challenges similar to their own — solved their pain points by making a purchase. Credibility is what gives the people around you a reason to trust you. For example, let’s say you’re looking at a product on Amazon, and you scroll down to the customer review section. You find that almost everyone has given the product a five-star rating or has written a positive comment about their experience. These comments and ratings build credibility for that product and brand. Marketing case studies help your company build credibility. They also convince prospects to give your product a try when they see how many people already trust you, love your products, and believe in your mission. Case studies are a bottom-of-funnel strategy that will help you convert more leads. If a prospect is on the fence about your product, case studies are the marketing technique that will push them closer to that purchase decision. For example, if a potential customer visits your website and they watch (or read) multiple case studies explaining the ways that customers have had success with your product, then they too may feel excited to become a customer. If that same prospect just left your competitor’s website where there were no case studies, your solution then becomes an easy sell … and your competitor becomes obsolete. Marketing case studies retain value over long periods of time — meaning the same study has the potential to convert leads for years. Unless you have a revamp or a complete update of the product being referred to in your case study, it can remain on your website as long as you see fit. Now that we’ve reviewed the reasons why you should have case studies on your site, you might be wondering how to actually create a marketing case study. First, it’s no secret that video content is more effective than written content. So, if you can create a video case study, do it. If not, be sure to include images throughout your written case study to break up the text and provide visual stimulation for readers. Second, remember one size does not fit all when it comes to creating case studies. They vary in length, format, content, and style based on what experience you want to provide for your potential customers. Keep this in mind as we go through the following example … some of the content here might work perfectly in your case study, and some might need to be modified. 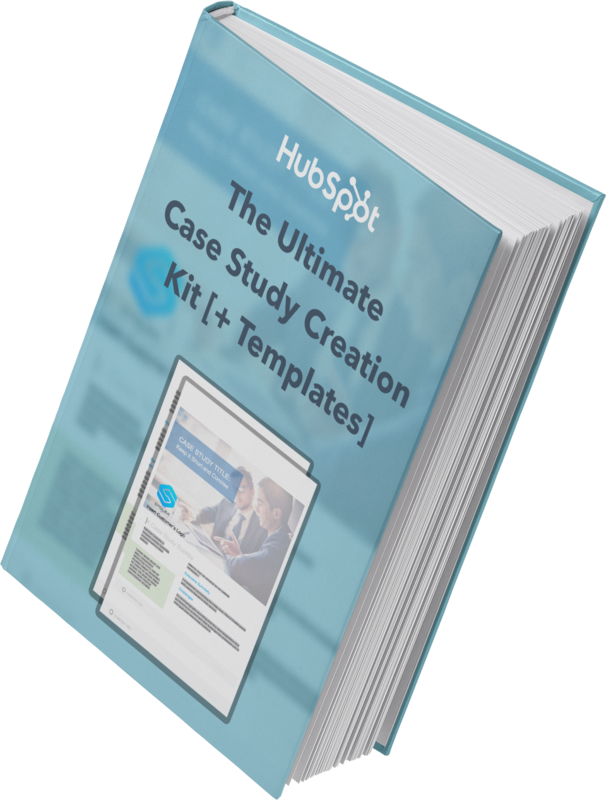 If you need some guidance, check out HubSpot’s Case Study Creation Kit. To determine which format you want to use for your case study, think about what type of content would be most beneficial for your buyer personas. You should consider what challenges your buyer personas might face, what types of industries they work in, their locations, and their business demographics. Two commonly used marketing case study formats to consider include an exposé and a transcription. An exposé is an interview technique that covers specific details about a topic, event, or individual. If you look back at the case studies on the HubSpot landing page, you’ll see the exposé format in action. The director, or author, is conducting the interview, leading conversation, and asking the interview subject questions about their interactions with HubSpot. Tip: When you’re recording a video interview for your case study, make sure the interview subject repeats your question before providing an answer. This is a simpler case study format. It’s a transcription of an interview with your customer, meaning there is typically a significant amount of text for potential customers to read through. Be sure to include the interview questions throughout this type of case study so readers know exactly what the interview subject is referring to. Lastly, feel free to pair your transcription with a series of images or even video to break up the text. The interview is the most important part of the case study … and quality matters. Strong interviews and videos take time. It’s not unusual to conduct a one to two-hour interview just to get a solid two minutes of video to use in your case study. During the interview, you should ask your customers about their lives prior to purchasing your product, what it was like to acquire your product, and how their company’s future has changed because of their purchase. If possible, record the interview. If not, be sure to use a transcription or audio recording device to ensure accurate quotes and statements throughout your case study. Ask about the customer’s life prior to your product. Who are you? What is your title? What does your company do? What challenges were you experiencing that made you realize you needed a solution? Why was finding a solution to this challenge important? Ask what it was like finding and purchasing your product. Capture general commentary — information that anyone could understand — from your interview subject in this section so potential customers can relate no matter their background or experience. How did you find our product? What was your experience like while purchasing our product? Ask about your customer’s criteria during their search for a solution. What was crucial versus what was nice to have? What were the results that came from using our product? How did our product solve your challenge? Ask for numerical results and hard data. Get proof of these from your interview subject (or even your own company if you have records). What were you able to start doing as a result of our product working for you? What are the intangible results of our product? Ask about the impact that the product has had on your customer’s life. How did our product change your view of your company’s future? What would your future be like without our product? After conducting your interview, it’s time to actually put your case study together. Edit your interview down to the most important, relevant information for potential customers to learn about your product. Cut that hour-long video interview down to a minute or two of the best clips. If your interview is going to become a written case study, include the very best quotes. Make it easy to read by separating your information with the help of headers, bulleted lists, images, and bold or italicized text. Create a case study library. By creating a case study library on a landing page — similar to the HubSpot landing page or this page by Fractl — you provide your potential customers with an easy way to learn about your products and company as a whole. A case study library or landing page will prevent potential customers and leads from having to dig around on your website for any product information they’re searching for. If this information is not easily accessible, they could lose interest, become frustrated, leave your website, or even find an alternative solution on a competitor’s site. Case study landing pages and libraries also help build credibility, look official, and typically bring in a lot of traffic — both through people searching for your company’s website and organic search. According to Fractl, their case study landing page is the second most-visited page on their entire website. Additionally, it is their fourth most-visited page through organic search. 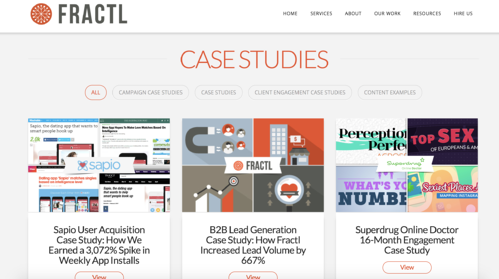 Lastly, they’ve seen a huge boost in converting visitors to leads since the creation of their case study landing page — half of Fractl’s leads view at least one of their case studies. Surround your case studies with social proof. If so many people are saying it’s true, then it must be true — this is how companies use the theory of social proof to their advantage. Social proof — or in this case, your friends all jumping off of the bridge — influences people to make decisions based on the expectations and behaviors of the people around them, even if their decision would be different if they were alone. Companies use social proof in the form of customer reviews, logo walls (that is, the logos of companies that have purchased their products), or long-form videos. Social proof acts as a supplement to the information in a case study. By showing potential customers how your products have changed the lives of other individuals, teams, and companies, prospects are more likely to buy into your claims and believe your product could help them, too. Add product overviews to the case study section on your site. If you’re editing down your case study interview and realize your interviewee said something vague or made a comment that a potential customer may not necessarily understand, you can add a product overview or reference guide next to that case study. For example, imagine HubSpot is conducting a case study interview and an interview subject goes into detail about the specific functions of Workflows. A potential customer may not know much about HubSpot’s Workflows, so a detailed discussion about their features may not be relatable and could even raise some questions. 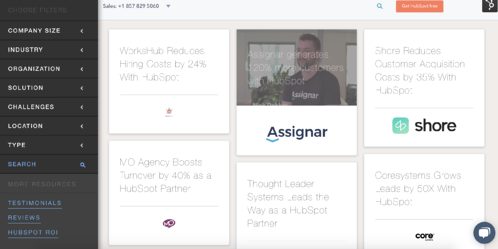 By including an overview or description of Workflows next to the case study where the product was mentioned, HubSpot can provide clarity for the viewer. You will also avoid making potential customers feel confused or uninterested. Keep your sales team in the loop. Once your case study is complete, you should notify your sales team so they can use them when reaching out to potential customers. They will be able to incorporate this information into their sales enablement kits — which include the technologies, processes, and content that allows them to sell efficiently and effectively. By learning about the ways that real customers are using and benefiting from the products they are selling, sales teams can share relatable stories with potential customers and leads. These will help build trust and, most importantly, increase sales. To help your sales team narrow the vast amount of information that typically comes from an in-depth case study, provide them with key takeaways that they can share with potential customers and leads. These key takeaways should include information about the interviewee’s background, title, and experience level and details about their company’s size, industry, and potential annual revenue. This data will allow the sales team to tailor the information they share with potential customers and leads, organize it for future conversations, and make more efficient and impactful sales. As I mentioned, every company is different and every product they sell is unique. Not every company will need the same number of case studies on their website to have an impact. To determine the right number of case studies for your company, think about the following tips. Cover all of your bases. A good rule of thumb is to have at least one to three case studies for each of your buyer personas. To do this, cover a range of industries and types of companies, and interview people of different backgrounds, titles, demographics, and experience levels. You should make sure there is something for everyone who visits your website. If your company targets customers all over the world and has offices located around the globe, this is especially important to consider. Think about what works for your buyer personas, your company’s location, and your goals when deciding how many case studies you need. Having an extensive list of case studies sounds like something everyone should have … right? Not always. Think about it this way — if your company is on the smaller side and is relatively new, there’s a chance you haven’t given your customers much time with your products yet. There is also a chance that you don’t yet have a wide range of customers. If your company then takes the time to create dozens of case studies, potential customers may feel you are being inauthentic and even unconvincing. It may also be a waste of resources that you can’t quite afford as a new business. To be effective, try to make every one of your case studies relatable and helpful for your personas. Cover multiple use cases in each of your case studies when possible. You’ll not only simplify your own life, but you also keep your case study library clean and impactful. Case studies are powerful marketing tools. They tell your potential customers relatable stories, demonstrate your company’s success, and help you build credibility. Case studies will help you reach your audience in a way that no sales pitch, email, newsletter, or advertisement will. Plus, if your company made such a positive impact on a customer that they want to share their experience with others, why not broadcast that story? Now it’s time to start creating content that matters to your potential customers and converts more leads.